Posted on September 28, 2012 by Thannaree C.
“I was born into a Lisu family—the Lisu are one of the hill tribes of Southeast Asia—on May 9, 1982. My parents, who are farmers, gave me the nickname On, which is what everyone normally calls me. Issaraporn Saeyang © Ezistock Co., Ltd.
“I have three brothers, one older and two younger, but they had to drop out from school as teenagers because my parents couldn’t afford further education for them. They kept me in school because I was an only daughter, so I was able to complete the first level of secondary school. When I was 18 they sent me to study Chinese in Doi Mae Salong, a small town in the highlands of Chiang Rai Province settled by Chinese people who emigrated from Yunnan Province when the communists won the revolution in China in 1949. Cotton shoulder bag, ‘Chiang Mai River’ © Ezistock Co., Ltd.
“I smile when I think about the happy memories I have of Mae Salong. I was a teenager and didn’t have much to worry about. I was in a group with around nine friends. Initially we studied with a tutor but later on we had to enter a Chinese school and study with kids from grade one. I was there for about a year. A few of the Chinese boys would flirt around with us, which irritated the Chinese girls who would then try to make trouble for us in silly ways. Because I was young and didn’t really know how to handle the situation and perhaps because I couldn’t see what benefit studying Chinese would bring to me in the future I dropped out of school rather easily and came back to stay with my parents in Chiang Mai. “Later on, when I went to Bangkok with my brother to help my mother sell hill tribe bags, I met my husband. He is half Chinese and half Akha (another hill tribe group in Southeast Asia). At first, we tried making a living together by selling things in Pattaya but we didn’t do so well because we had to buy things to sell rather than make them so our costs were high. 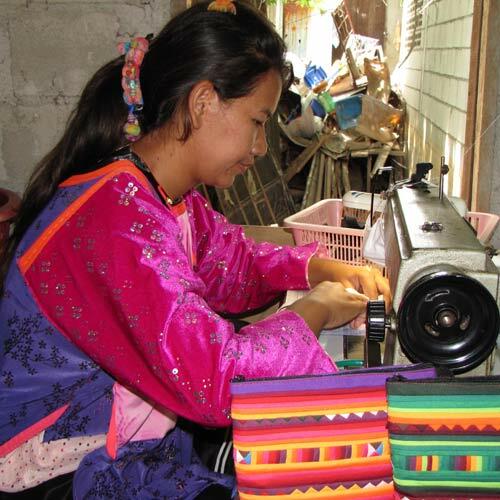 Though, like many other girls from my village, I had learned to do embroidery and sewing work from around the age of seven, I did not have a sewing machine and couldn’t make bags for myself. 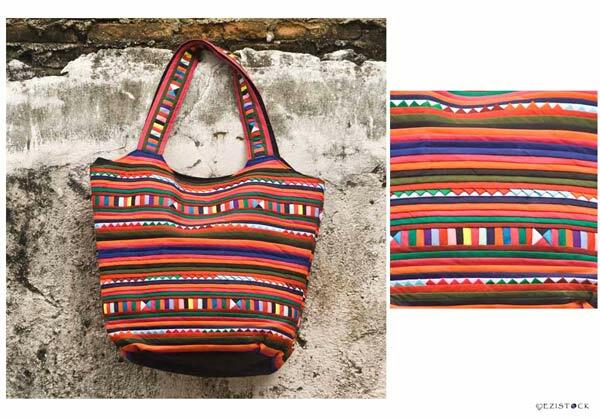 Cotton shoulder bag, ‘Spicy Chili’ © Ezistock Co., Ltd.
“When I got pregnant, we decided to come back to Chiang Mai. 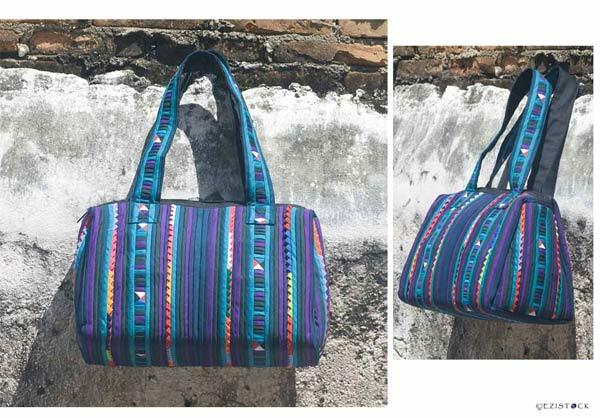 We used to make Lisu embroidery and decorative cloth that was sold by the meter, but people stopped buying it so we began making bags using material embroidered with Lisu patterns, which sold a little better. “My daughter is now three years old and is very interested in what I do. She often cries because she wants to sit on my lap while I make bags but I don’t let her because she is still too young. I will probably teach her to do some embroidery work when she is a bit older so that we can spend time together rather than because I need her to help out with my work. I expect she will enjoy imitating whatever I do. Cotton shoulder bag, ‘Bamboo Forest’ © Ezistock Co., Ltd.
“At the moment, we stay in Chiang Mai and sell in the local market every day. I am also trying to further my education by studying higher secondary level for adults at weekends. We also like to go back to our village quite often for traditional celebrations and rituals such as new house warming parties, marriages and funerals. We especially like to go back at New Year, when villagers put on their finest costumes and have a good time. Whenever I go back, I pick up bags made by my sister in law and other villagers who are helping out. “I once tried working at several different jobs but employers didn’t like me because I am not very healthy and get sick easily; none of my jobs lasted more than four months. Working for myself is much better as I do what I can when I can. Even though we struggle with sales and many other things in life, at least we are working for ourselves in our own small business. Unfortunately, because sales have not been very good, my husband may have to travel overseas and find whatever work he can so that can earn better money and send it back to help support us. 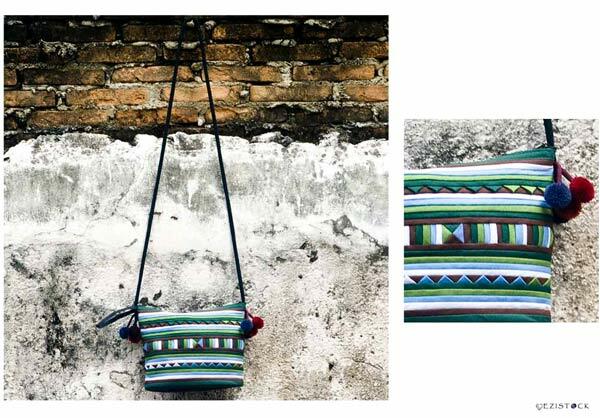 Cotton shoulder bag, ‘Sweet Liquorice’ © Ezistock Co., Ltd.
Issaraporn Saeyang at work © Ezistock Co., Ltd. 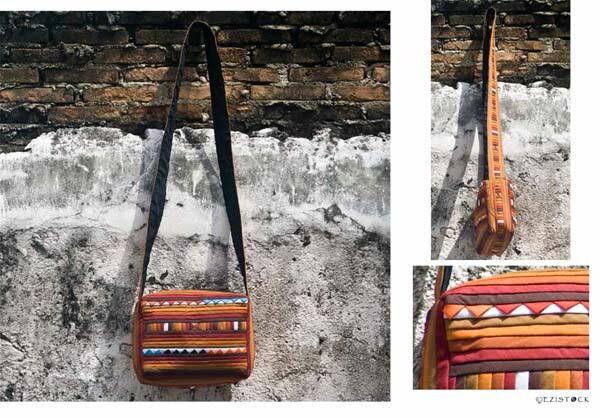 This entry was posted in Artists & Artisans, Arts & Crafts, Hill Tribes. Bookmark the permalink.